Did you know that the U.S. government is "committed" to distributing more than $1 trillion in money, services, free trips, and other giveaways? Despite the budget battles, that money is still there and has already been allocated. On a percentage basis, every family's share of the pie comes to around $20,500. What's more, only 12% of the money in these programs is designated for the poor. Unfortunately, most people don't even know about the thousands of government-giveaway programs available to them. That's because most of these programs are funded by Washington but administered through either the states or little-known organizations — and 75% of the programs have no income thresholds. You can't easily find these programs on Google. And despite these programs being displayed on several government websites, most people have no idea they exist. That's why many ordinary people miss out — and let the tiny handful of "in-the-know" folks get all the freebies. But now you can get YOUR fair share — with your copy of our brand-new special report, Free Stuff and Great Bargain Adventures for People Over 50. You'll discover if you qualify for . . .
We assembled a tremendous amount of how-to information into one simple, easy-to-follow special report. This will save you hundreds of hours of research and telephone time — and will help you quickly and easily access the thousands of federally subsidized programs now available for people of all income levels. Best of all, the programs listed in this amazing special report are not difficult to apply for. In fact, many of the applications are short and simple — at most, three or four pages long. And if you have difficulty, guess what? There are even special government offices dedicated to instructing you about how to take advantage of government programs! If you don't know if you're eligible for a specific giveaway program, there is a little-known website that will tell you. You'll find out all about it on page 5 of the special report Free Stuff and Great Bargain Adventures for People Over 50. The fact is, thousands of laws mandate the U.S. government to spend these funds. The money has already been allocated, often to state agencies, to distribute it. There is a special agency, in fact, that helps older people gain access to services and programs no one knows about — including subsidized vacations to places like Disney World. 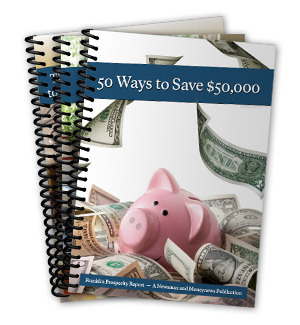 Bonus Report #1: 50 Ways to Save $50,000 (a $49 value). Here, you'll discover 50 specific, powerful ways to slash thousands of dollars a year off the cost of everyday items — such as new ways to save on car and home insurance, how to cut your prescription medicine costs in half, and how to reduce your credit card and loan costs. All together, these amazing savings can add up to an extra $50,000 over a one- or two-year period. Bonus Report #2: Pay Zero Taxes! (a $49 value). According to Jeff A. Schnepper, author of How to Pay Zero Taxes, you are facing "the biggest tax increase in the history of the income tax." But in this valuable free bonus report, you'll discover the highest-impact, easiest tax deductions and credits to claim. These are actionable steps that most people can and should take to greatly reduce their tax bill. Bonus Report #3: Save Thousands on Soaring Education Costs (a $49 value). Education lending is becoming a very big problem for students, parents, and our country. Average student debt ballooned to $27,204. But now, you can help your kids or grandkids go to college by taking advantage of the tips in this valuable bonus report — for example, how to attend one of the world's top universities for only $3,300 a year. Bonus Report #4: The Individual Investor's Guide to Buying Gold Coins and Bullion (a $49 value). The guide reveals what specific coin you should own for maximum profits (and it isn't the American Eagle!). We also disclose a specific website to use to get the REAL price of gold along with one bait-and-switch tactic that could leave you in the poorhouse. Bonus Report #5: 8 Surefire Ways to Be Richer a Year From Now (a $49 value). This report shows you how to go from saving, to investing, to even giving away more money than you ever dreamed. Follow this simple eight-step plan to wealth and retire earlier than you ever imagined. Bonus Report #6: Save Up to 50% on Your Grocery Bill (a $49 value). We spend more money on food than anything else (outside of taxes!). This guide will show you simple strategies to save money and buy more. These tactics don't require a lot of work and spare you the hassle of extreme couponing. Bonus Report #7: 33 Ways to Save on Healthcare This Year (a $49 value). It has been proven that healthcare expenses will surmount $200,000 per couple during retirement. This guide will allow you to save thousands of dollars in 33 different ways. 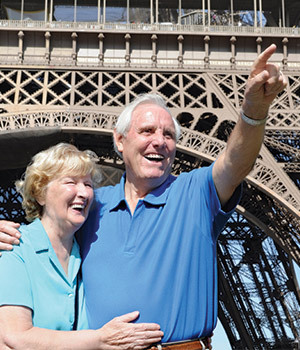 Bonus Report #8: Strategies to Maximizing Your Social Security Benefits (a $49 value). According to Matthew Allen of Social Security Advisors, the Social Security Administration is actually prohibited from helping you make personal decisions regarding when and how you should file for Social Security benefits. This report gives specific strategies from Matthew Allen to increase your payouts such as the "File and Suspend" technique and the "Restricted Application" strategy. 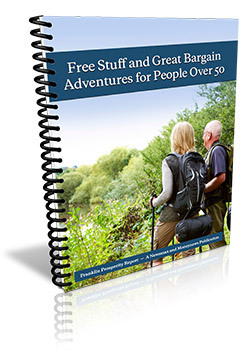 You'll receive print copies of everything by mail: the Free Stuff and Great Bargain Adventures for People Over 50 special report. . . eight exclusive bonus reports (total value of over $400). . . a 4-month trial subscription to The Dividend Machine newsletter and a one year subscription to The Franklin Prosperity Report newsletter for only $49.95. (See order page for complete details! ).